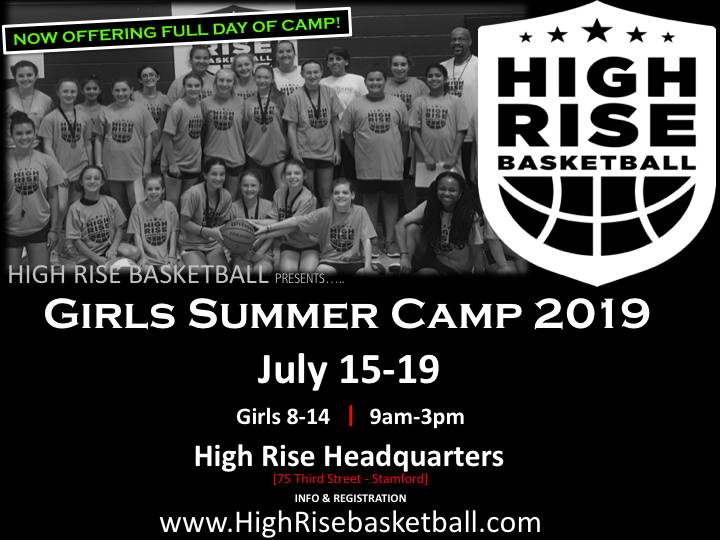 Camp is the signature product offered by High Rise Basketball. At our camps, young players are able to enjoy the game and improve their skill set in a safe, fun & positive environment that caters to beginners & seasoned players alike. Since 2011, our summer camp has grown to be known as one of the premier camps in the Fairfield County area, also drawing kids from Westchester County. While we have grown, we have continued to provide each individual camper with a fun and effective week of QUALITY fundamental drills, games, contests, speakers, and more. From beginners to experienced travel/AAU basketball players, our summer camps are the perfect place to work on your game in the summer! Summer Camp is the first event High Rise ever put on back in 2011. Since then, Summer Camp has grown, but maintained the same quality instruction, staff, and experience. Camp typically runs Mon-Fri from 8:30am-12:30pm and campers can choose from single to multiple weeks starting from late June/early July, and running into the beginning of August. Holiday Camps are typically offered during school holiday breaks and range from single day camps, to 4-day camps during larger school breaks like Holiday, Winter & Spring recess. These camps usually feature the same time and structure as our summer camp and sometimes offer single-day registration. 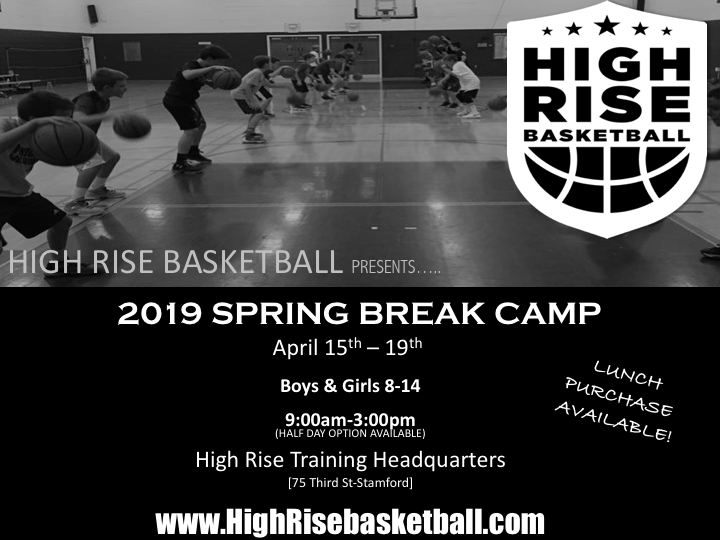 High Rise also offers specialty camps from time to time that cater to specific groups, focus on specific skills or styles of play, or even feature NBA or WNBA players. Typically, these camps are single-day events. Skill Development — Each day campers will be put through various stations that focus on fundamentals such as ball handling, passing, offense with & without the ball, shooting, rebounding, defense, and more. Games — Campers will be divided into separate teams coached and refereed by HRBA staff members. Teams are guaranteed to play 1 to 2 organized games per day. Counselors — Our staff includes local coaches, as well as current & former Division I, II and professional players. Contest — Campers will get the opportunity to compete in various skills challenges with the chance of winning awards/prizes. Guest Speakers — Special guest speakers will include professional players, current & former division I & II collegiate players as well as current high-level high school basketball coaches. Teamwork & Sportsmanship — Campers will be immersed in an atmosphere that is highly educational and motivational. Participants will develop team concepts, good sportsmanship and character throughout the course of the camp. Camp T-Shirt — Each camper will receive a T-Shirt with the official High Rise Basketball Academy Logo. Facility — The camp will be held in an air-conditioned facility with a regulation size basketball court. High Rise Summer Camp is back for the 9th summer with more locations and options than ever! Join us for a week of skill instruction, competitions, games, and more fun activities! Camp is perfect for beginners, advanced players and everyone in between! Registration is now open for our Greenwich and Stamford locations!